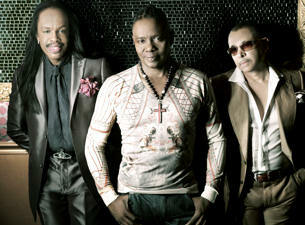 Earth, Wind and Fire came to Columbia, SC on Friday night at the sold-out Township Auditorium looking to start a party. And that’s exactly what the legendary band did. They brought an 85-minute set that spanned over 42 years of music. Three original members remain on tour with EWF: Verdine White, Philip Bailey and Ralph Johnson; along with a whole ensemble of backing musicians. The stage had a big projector screen hanging in the back. There were two risers on the stage, one holding the drums and other keyboards. There were also video screens on the front of those risers. The backing band came out with an instrumental intro. The originals then came out and went straight into an extended version of the all-time classic “Boogie Wonderland.” White went into a jamming bass solo. He got low while the audience was standing high. There was also a section which included a Spanish-influenced mood where the band danced in sequence. The unsung hero of the concert must have been rhythm guitarist Serg Dimitrijevic. He stood to the left of the stage – almost hidden – strumming funky string-muting chords constantly. He did get a chance to dance in coordination a few times along with a brief solo later in the night. While he is a small piece of the EWF puzzle, he added a huge part to the band’s overall sound. During “Serpentine Fire,” the classic music video was shown on the big screen featuring the band in its formation from the late ‘70s. Bailey played the thumb piano – kalibma – during the aptly named “Kalimba Story,” which gave the song an exotic sound. There was also an accompanying sax solo to pick up the groove. There were cameras hidden in pyramid shapes just on the edge of the stage, which was very unique. Throughout the concert, those cameras would zoom in on different members of the band while they were singing or soloing. They would also pan through the audience members in the first few rows. Those images would be featured on the big screen. It must have been controlled by a joystick by someone at the soundboard. Johnson finally got his time to shine during “Evil.” It was an extended jam session for him on percussion. Bailey showcased a masterful vocal performance during “Reasons.” His brilliant falsetto singing brought the audience to their feet. After the spectacular display, he wiped away what could have been seen as tear or sweat from his face. He then thanked the crowd for all of the love and support that they showed him. They played the timeless “Got To Get You Into My Life,” a Beatles cover. Dimitrijevic finally got his chance to shine with a brief solo out front. Well, Mr. Dimitrijevic, you and EWF are welcome to being the party back to Columbia anytime in the future.